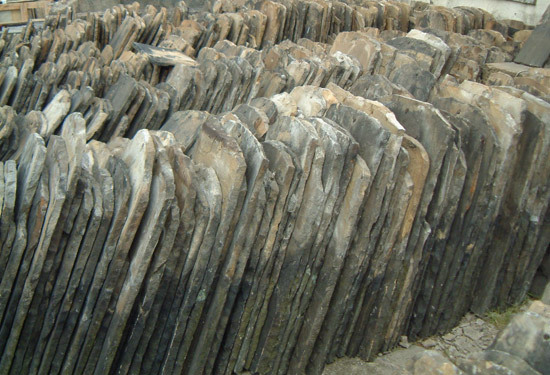 Reclaimed Yorkshire stone roofing slates, or 'Yorkshire greys' are reclaimed traditional stone roofing slabs that are very popular for new builds and renovation work. The 'Slates' are actually made from Yorkshire Stone. The term 'slate' refers to the application in which it is used, not the material from which it is made. Many houses and mills in the Yorkshire area have been tiled in Yorkshire stone slates for hundreds of years. The stone provides excellent weather protection and durability. Many of the roof slates that are salvaged will be in excess of 100 years old. This is testament to the strengths of Yorkshire stone and reassurance that the life span can continue for many more years. Examples of reclaimed Yorkshire stone slates. Below are some examples of Yorkshire stone roof slates. Click on the small photo for a larger image. What does diminishing courses mean? Yorkstone slates are traditionally random sized. The widths and lengths both vary. Slates are laid in diminishing courses from the larger ones at the bottom to the smallest at the top. This method, although a little tricky to master provides a very pleasing result. The photograph alongside shows the subtle reduction in size as the courses ascend the roof, this is not generally noticed but you will probably appreciate the pleasant appearance and a sense of balance over the whole roof. Yorkstone slates can range from over 1 metre (40") tall down to around 300mm (12") tall. The widths vary from as much as 800mm (32") down to the smaller slates of about 150mm (6") wide. This traditional form of slating is very common in Scotland and the north of England. It does require the skill of an experienced slater but produces a weather resistant, high quality and most attractive roof. 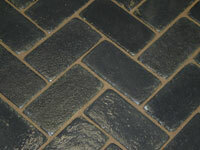 Langley Indian stone paving slabs. Similar to Yorkstone colouring, yellow / buff. Click for more info.